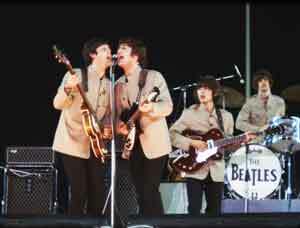 PLUS, unavailable on DVD, streaming or VOD, the legendary 1965 The Beatles Live at Shea Stadium (30 min. ), a concert previously seen only by people who witnessed it live. Tickets are on sale online and at Kiam Records Shop at 95 Main Street in Nyack. Online ticket sales close at 3:00 PM on Saturday, Dec. 17. Tickets will still be available at the door and at Kiam Records, while they last. Support our annual holiday toy drive and bring an unwrapped toy for ages 6 to 14. Celebrate the Beatles, the holidays and Rivertown Film’s 15 year anniversary!